Since October I’ve been fortunate to host storytelling events here in Bremerton. Over five months we did three at the Manette Saloon and since March, thanks to a partnership with the Friends of the Kitsap Regional Library Sylvan Way Branch, we’ve been going monthly at the Cloverleaf Sports Bar and Grill. At the bottom of this post I’ve left a few samples of what we’ve heard at the most recent two. On Thursday, in addition to hearing great stories around the theme, “The Great Outdoors,” the library will hand out something to prepare you for a special Story Night in October. Each year the library hosts a monthlong event in October called “One Community, One Book.” The library’s program is designed to get the entire community reading a single book together. 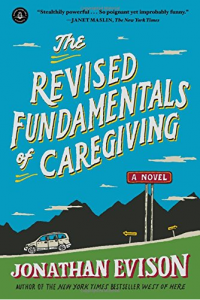 This year’s book is “The Revised Fundamentals of Caregiving,” by Bainbridge Island author Jonathan Evison. In October Story Night will center on the themes found in the book. Over the next couple of months I’ll get a discussion going on those themes over at the Story Night main page under the Events tab, and on the Story Night Facebook page, which you should go “like” right away. To prepare you for the One Community One Book event, on Thursday the library will hand out one copy of Evison’s book per household at Story Night. The idea is once you read it, pass it along to someone else. It’s a chance for members of the community to bond over a single story. I’m glad we can do our part. I’m a believer in our stories. I wanted to start Story Night in some part because I wanted to get better at live storytelling. I’m not sure that has happened for me personally, but what has happened is I have managed to get connected to a part of our community I might not have otherwise known. We understand each other better through our stories. We find ourselves more willing to shed our judgment through our stories. We empathize. We don’t always agree, but we see someone we might have discounted as an enemy as a teacher. We relate in ways we didn’t know we could. Want a taste? The first story below was told at our June event by Alison Loris. The theme that night was “Advice,” and Alison told us a story about the advice she received from her former husband Jesse Bernstein, a Seattle poet and performer. The second recording features two stories on the “Summer or temp jobs” theme from July. Scott Park explains the story behind why he wears long sleeves at work even on the hottest of days. Rosi Farley details the grueling work of laughing for pay. On Friday the site passed the $4,000 mark. The big guy got close. Photo taken from video shot by Emilee Wright Fyffe. It was May 2002 I drove up from Camas, Wash. to interview here. Another reporter had already been picked for the job I was after, but the editors told me I’d likely be luckier in the summer. I didn’t know if I would want a job here, but I knew I wanted to want the job. The other notion that fascinated me was the idea that on any given day I might be near water in which I could see orcas. I had been to Sea World in San Diego as a kid, back when most of us bought into the idea that zoos and ocean parks were good because it gave us a chance to see something we otherwise wouldn’t. It took about 30 years and one viewing of Free Willy to call that idea into question. I wanted to see orcas in the wild. This was the place. My luck there has been spotty, but within three years I saw them twice, once in Silverdale and once on the ferry to Seattle when I was headed there for work to greet a veteran coming home on Christmas Day. Those were both distant and fleeting viewings. It took several more years to spot any more, and that was a good one. 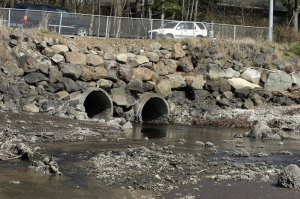 One day after work I heard the whales were in Bremerton and I drove to Bachmann Park, knowing that was their likely path out. I scored as I watched them pass all too quickly. I don’t know that it can get any better than it was on Monday, though. We had family in town from Utah and decided to spend part of Memorial Day at Point No Point Park in Hansville. 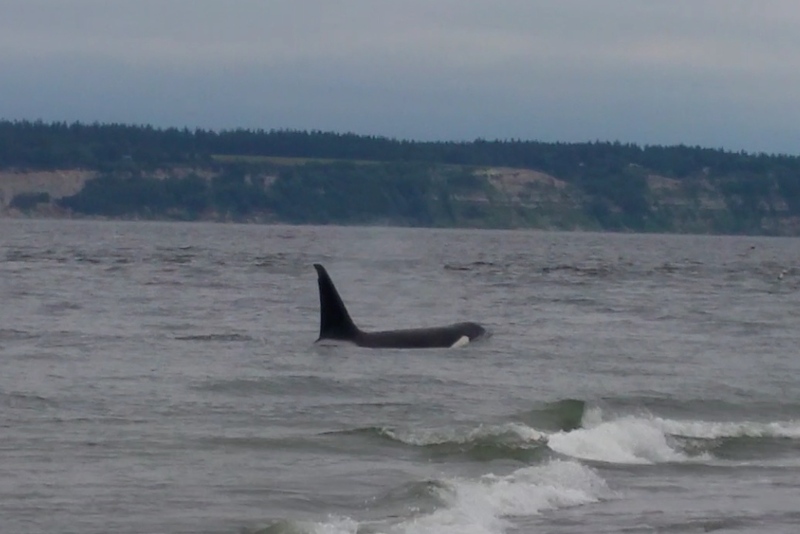 While I dozed off in a camp chair I heard my sister in law yell that there was a killer whale. It was a great scene out in the water as the whales headed south, then stopped in a spot for a while. 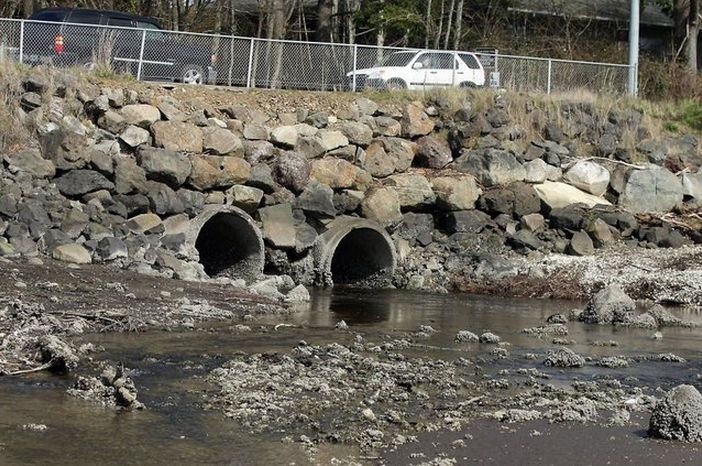 We guessed they were feeding on salmon. And then, like a miracle, one giant orca surfaced probably 50 feet from shore. The entire beach began to follow it then, and the visitor gave us one more view. This is one of those times we’re not only lucky to live where we do, but when we do. I had left my phone in the car, but I was the only one. There were plenty of cameras pointed at the ocean to capture the action. My thanks to Emilee Wright Fyffe for sharing the video. If you’re among those whose luck has not been this “amazing,” have faith that your day will come. Enjoy the video. The first 1 minute 30 seconds was the kind of sighting I had always envisioned at Point No Point. I wasn’t counting on “amazing.” The big guy makes two appearances in the last part of the video to make that happen. 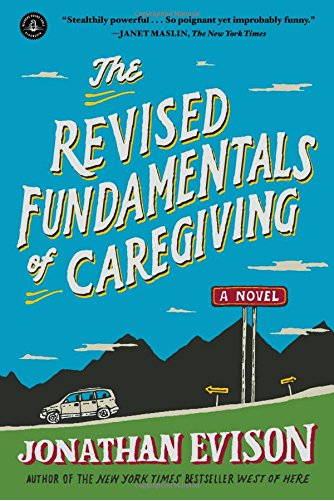 Having read the previous 186 pages, seeing Cady come to the conclusion, “I’d leave me, too,” might inspire you set the book down for a moment and, if you’re a demonstrative type, yell out, “You think?” Yelling at a book doesn’t count for normal activity in most settings, but page after page Cady gives you reason. For the uninitiated, Cady moved to Los Angeles after high school to pursue her Hollywood acting dreams. Over the years she landed some screen work, but not a lot. Finding a friend was tough, too. 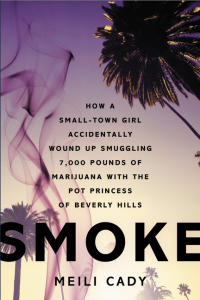 A mutual friend introduced her to Lisette Lee, the “Pot Princess” in question. The story of what happened over the next few years was first revealed in a 2012 Rolling Stone story, “The Gangster Princess of Beverly Hills.” That was the first time many of us were introduced to Cady, who was Lee’s unlikely friend. When we did our story on Cady I was somewhat sympathetic to her, because in five decades I can count a few times when I’ve done things despite my suspicions because I wanted to believe those suspicions were off base. Wanting to believe can be a real hazard. 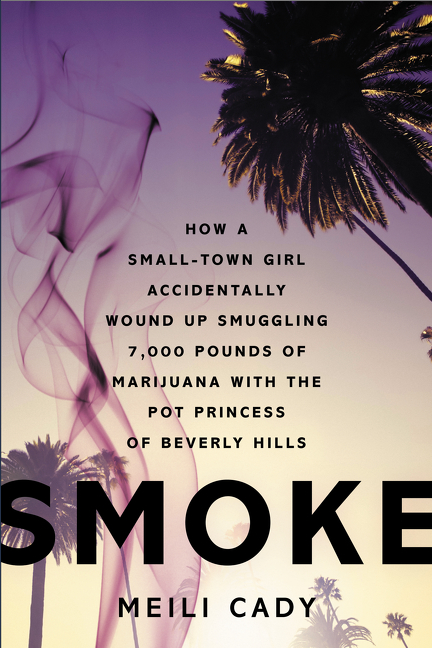 Reading Cady’s own written version in “Smoke,” I was less sympathetic, and that might be a compliment to her. Cady tells us what happened, what she did, without much effort to justify it. It’s a gutsy move. It’s also the most accountable way to tell a story. The book is a fast read, reveals much that you didn’t know from the earlier stories and could be the last we ever hear of this tale, unless Lee starts talking or there is a movie. I don’t know about Lee, but the movie is a real possibility. On Monday 19 of our ambitious, dedicated and skilled friends will run the Boston Marathon. Bib No. 18775 is a friend of ours. Who you see here as Luz M. Rodriguez is someone my wife, Diana, and I know as Marcela. We met Silverdale’s Marcela when she and Diana were teammates in a relay that runs essentially from the Canadian border in Blaine to somewhere on Whidbey Island. Those relays are a tough haul. Diana had to run two extra miles when she missed a turn. Marcela herself wasn’t sure she could tough out the last of three legs each runner agrees to run, but she did it, making it look like it was easy. Diana has since run the Portland Marathon and from what I can tell is not eager to run another one. The view from Chile of Silverdale’s Luz Marcela Rodriguez. 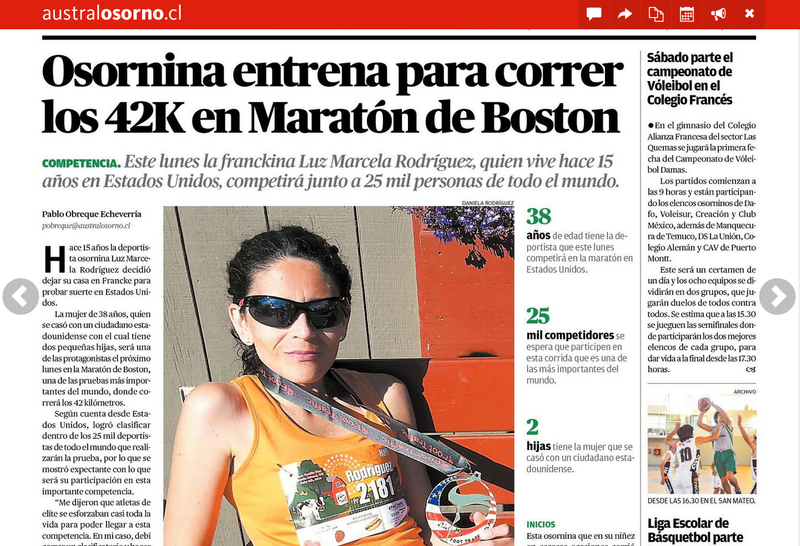 While I don’t agree that anyone can qualify for Boston, if it’s not a marathon that’s in your dreams, there is something. And in that sense, Marcela is right. If she can achieve this dream, you can achieve yours. I have a few things I dream of accomplishing, and finishing a marathon is one of them. Aside from the fact that it’s hard for anyone (Well, a few people make it look pretty easy.) to run 26.2 miles, for me to do it would prove that I had accomplished so much more. If you’ve met me, you know what I’m talking about. Any marathon would be my Boston. So maybe that’s the question. What is your Boston? 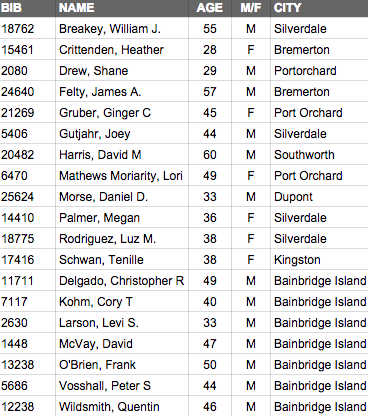 Good look to all our Kitsap runners. Thanks for inspiring us to pursue our Bostons. Note from Esteef: I tidied this thing up quite a bit since its initial publication. I normally give these things at least another read or two before hitting the “publish” button, but it was late on Friday and I spent most of the week coughing, so I was tired and ready to go home. Had I read it at least one more time I might have noticed a few things that needed changing, including the fact that I misspelled Marcela’s name throughout. I also forgot to mention that of all the Spanish or Portuguese-speaking nations in the world, Chile is the best. It’s not even a close contest. Some of it is the dramatic variety in the nation’s landscape, going from the driest climate on Earth to a point where the next neighbor to the south is a penguin. It’s also got great beaches, mountains and enough earthquakes to satisfy even the thirstiest of thrill seekers. I hear the wine is quite good. The shellfish is excellent and plentiful , Chileans have perfected the art of dressing up a hot dog and the empenadas should be part of every death row inmate’s last meal as a testament to our compassion for even the most vile among us. The best parts of Chile are probably the Chileans, except for the one in charge when I lived down there. He was a jerk. If you haven’t already heard that beginning July 1 Bucklin Hill Road is going to be closed for more than a year, I am posting this note on the off chance that you’ll find it out here. Though unlikely, it’s possible. If necessary, I’ll post it in an AOL chat room and more importantly on an Albertsons Haggen community bulletin board. 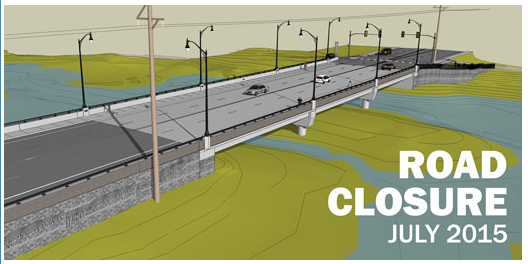 The more important news here, though, is the county has a website where you can get the latest on the project designed to deliver the bridge you see above. The county has set up a web domain BucklinHill.com, where you can see timelines, project history and a page dedicated to helping you plan your way around the closure. Note: When I first posted these photos earlier in the week, I left out most of the details because I wasn’t sure if I might include Ashtin Fitzwater in the story about 12s going to Arizona without game tickets. I posted it early because other news agencies were already getting the photo out there and I didn’t want to be too far behind them. So here is an expanded version of Wednesday’s post, with more information I had then, and updates, including one that’s humongous! And I don’t use that word or exclamation points liberally. 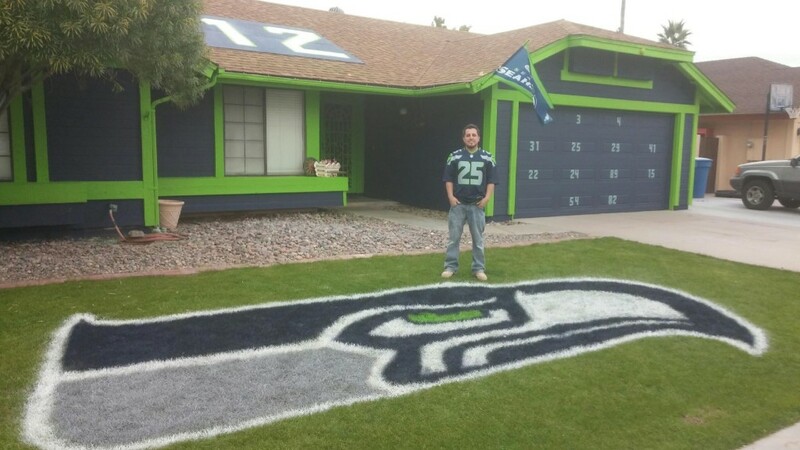 Central Kitsap High School grad (as well as Ridgetop Junior High School and Emerald Heights Elementary School) Ashtin Fitzwater represents the 12s at his home in Chandler, Ariz.
Ashtin Fitzwater left the Northwest in 2004 following his graduation from Central Kitsap High School, but remains a 12, representing in his new hometown of Chandler, Ariz.
We first posted this Wednesday, but a lot has happened since. Fitzwater took about five hours on a Saturday to paint the home he and his girlfriend rent from her mother. 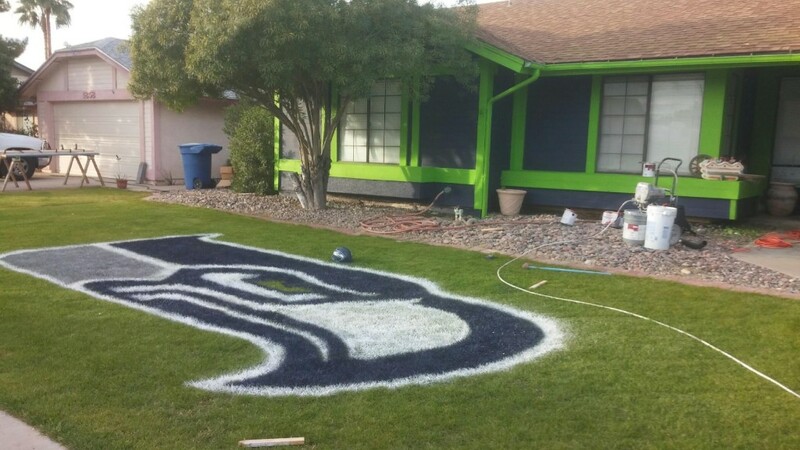 I was skeptical, and so was one of my editors, that a house could be painted in five hours, but Fitzwater has skills. He graduated from Arizona State University with a degree in housing and community development and has worked in construction since. “I’ve painted a lot of houses,” he said. 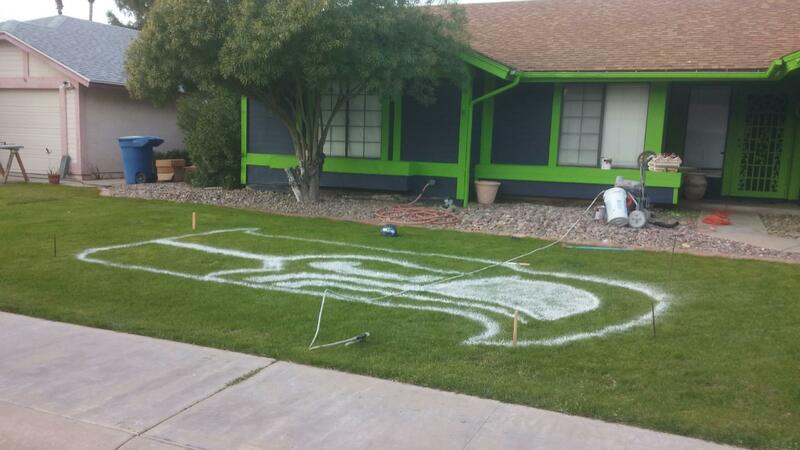 The Seahawk logo on the lawn was done by hand. 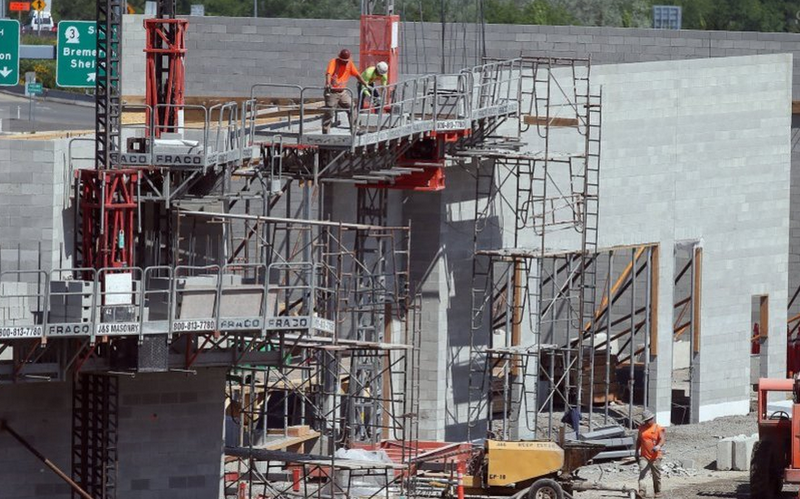 He set himself up to do it well, applying math to the Seahawk logo from his construction helmet to measure out a 20-foot-by-7-foot rectangle with corners staked with rebar. (And you kids say math won’t help you in life.) He used string to create the box for the bird and went to work, looking at his helmet and spraying the lawn. This week, as you can imagine, there has been a crush of media in Arizona, including lots from Seattle. KING-5 TV was, I think, the first media outlet to post pictures of Fitzwater and his house. Fitzwater’s brother, Jeremy Hunt, re-Tweeted a KING-5 photo and mentioned he’s a CK alum, so I got him on the phone. Since then, other Seattle news agencies have been by and the Fox affiliate in Phoenix paid attention. A Spokane station, KXLY, has given him the most attention, which we’ll get to shortly. Fitzwater said he’s seen lots of people driving by to get a look. A neighbor counted 30 cars one day. One family came by and the mom had a Patriots jersey on, so the 12s that were with her had fun and put duct tape over her mouth and wrapped a Hawk flag around her as they took pictures. The mom was a willing victim, so save the nasty letters. Yesterday when Fitzwater arrived home he found someone had left him a jumbo bag of Skittles. He set up a camera to see footage of people responding to the setting. A lot of people have taken selfies, some of them looking around nervously as if a house that’s begging for attention is also demanding privacy. One day Fitzwater heard a woman yelling “We found it!” to her friends. 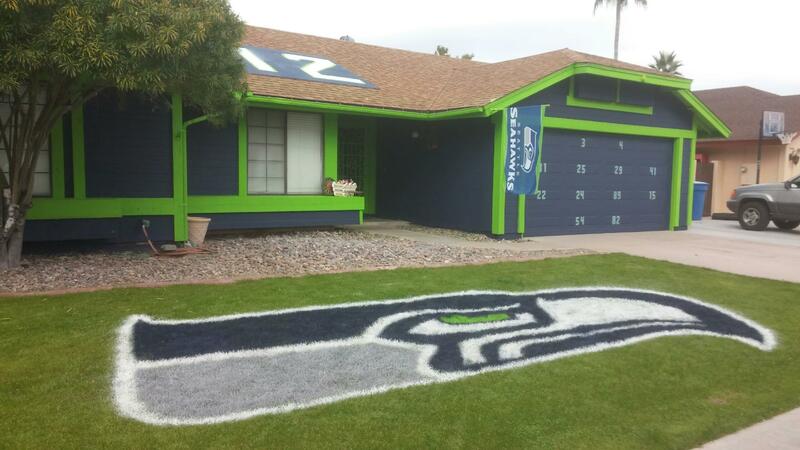 They’d been out scouring Chandler neighborhoods looking for the Seahawk house. As Fitzwater and I were talking Friday a mailman stopped across the street to get a selfie with the house behind him. And so it has gone, but that’s not the biggest news yet. Hunt is, as of this writing, traveling down to Arizona to watch the game with Fitzwater, but that’s not the biggest news either. KXLY caught the big news, Fitzwater proposing to his girlfriend, Melissa Duke, at night as both are standing on the Seahawk logo. The two have been together eight years and have been talking about marriage. They’ve been talking about it so much, in fact, that Duke kept telling Fitzwater that he couldn’t surprise her. A friend asked Duke on a scale of 1-10 how surprised she was by the proposal. Can you guess her answer? Hint: She’s a Seahawk fan, too. 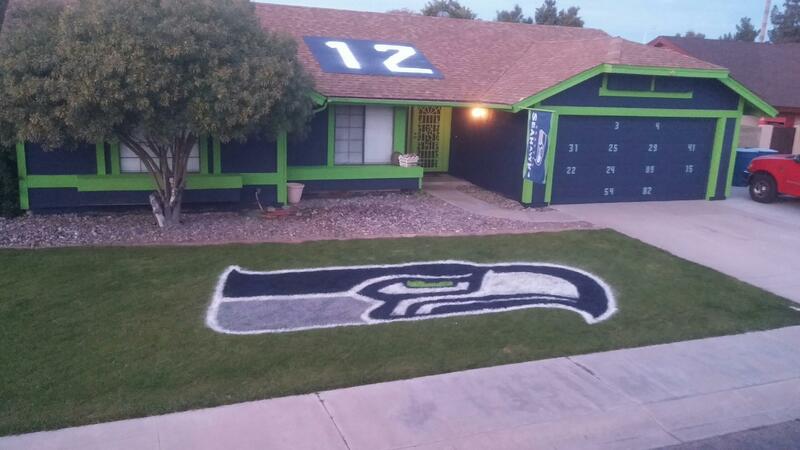 Second hint: Look to the roof of the house, or any car with a flag waving anywhere near Seattle. Standing behind them in the KXLY video were a pair of friends, Adam Collins (also a 2004 Central Kitsap High School grad) and Christina Adams. They’ve been engaged two years and have been having trouble figuring out where to get married and what kind of arrangements to make. According to Fitzwater they now plan to get married Sunday morning, on the Seahawk lawn. Duke, for her part, has always dreamed of a destination wedding, so she and Fitzwater are beginning to make their plans for sometime in the future. My suggestion: San Francisco, early February 2016. If all goes well they could be there to witness the birth of the Three-Hawks. The North Kitsap School Board is scheduled to meet Monday evening in executive session to review the applications for the vacant position on the board. The board is expected to make its selection Tuesday evening, election night. The District 2 opening happened when Dan Weedin resigned from the board in early October.